It is innovation that drives the success of every organization across the globe today, in the extremely competitive environment that they are in. Managing business processes today involves continuous planning, management, analysis, and integration. And these cannot be done on a project basis as earlier; they need to be executed continuously. This has led to the evolution of an organizational model based on a testing center of excellence (TCoE). 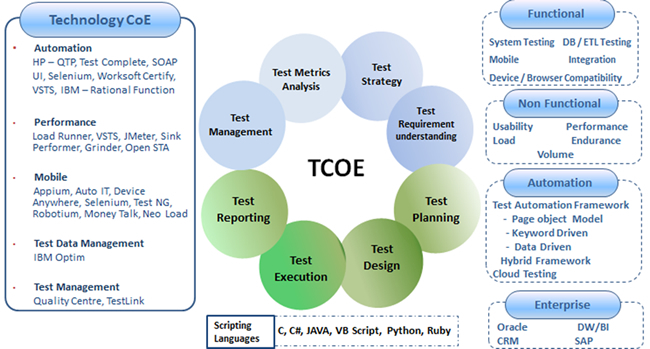 A TCoE is constituted of testing processes, people, and tools operating as a shared services function to provide testing services with maximum benefits across the entire test organization. An organization can benefit in terms of improved quality, lesser time-to-market and a lower cost of ownership on adopting a TCoE. A well-integrated TCoE can reduce redundancies, supports risk mitigation, and also control IT expenses. Analyzing the existing business processes of the clients’ organization with clear reasons stating the need to establish a TCoE. Identifying what needs to be tested across the board quickly, sharing observations and gauging the improvements that need to be made, clearly defining processes and templates for the workflows which are to be implemented to bring the required changes. It is imperative to get approval and agreement from all the stakeholders of the organization and ensure that all the teams involved have clarity regarding the changes that will result due to the implementation of the TCoE. Implementing the best practices using well researched and scenario-specific tools that will not only speed up the testing process but also help the teams involved to focus on other essential activities. It helps to reach a consensos with the organization regarding the intervals at which checks will be conducted to assure that the suggested processes are being followed. Working on improvements to generate better ROI and establish an atmosphere of quality. A TCoE, set up correctly, can help cross-functional teams collaborate, reduce redundancies and streamline diverse testing processes, accelerate the software testing life cycle. A well-integrated, holistic TCoE approach helps client organizations achieve the desired growth and excellence. As Customers expand the usage of Digital Environments and Agile development models, there is a growing trend where a portion of the TCoE consists of decentralized teams collocated with their Agile Development counterparts. Here the involvement is more from point of view of providing the necessary standards, Tools, processes and guidelines with respect to Testing. YASH has moulded its TCoE offering to cover both centralized and decentralized Testing teams. YASH provides a combination of a thin TEC Test Excellence Center and an industrialized TCoE providing a Factory approach. With a multi-dimensional testing Center of Excellence, YASH has the perfect blend of expertise and domain knowledge to offer the best of breed testing solutions. YASH Testing Center of Excellence (TCoE) solution is a robust framework that enables companies to establish strong quality processes and delivers proven results by helping organizations optimize application quality and performance, improve alignment between IT and business, increase QA efficiency and do more with their existing QA budgets, tools, environments and people. Nothing speeds adoption like success. Cost savings, on-time projects, faster innovation, and technology land mines identified and avoided are just a few of the benefits you can expect to achieve through a TCoE implementation. A steady stream of successful projects will ramp up the momentum, recognition, and ultimately, adoption of the TCoE approach.